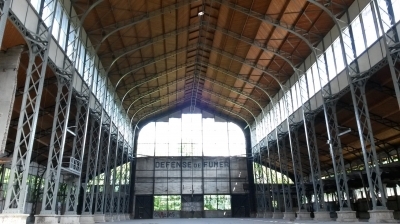 Hangar Y is part of the Tentative list of France in order to qualify for inclusion in the World Heritage List. We lived in Paris for 10 years and tried for a long time to find a way to visit this building with rare name. To the best of our knowledge, there is only one way to achieve this: it is open for Heritage days (usually held on the third weekend of September), not every year, and registration is needed prior to the visit, as it is done by guided tours only. Watch up for the Heritage days program on the city of Meudon website (usually published end of August) and follow instructions for registration. We visited that place in September 2014. For safety reasons, only one part of the building was accessible (and this must be the main reason to restrict the number of visitors), but this was enough to get a clear picture and understanding of the structure and the volume of the building. These visits can take place thanks to volunteers, part of an association aiming at protecting this building, trying to attract investors to restore it and, maybe one day, turning it into an airship museum. There were informative panels and people were here to answer questions. The tour also included a walk to the nearby hexagonal pond (“Bassin de Chalais”), once part of the park of Meudon palace. This building was designed to host machines and engines during Paris World Exhibition in 1878. At the end of the fair, it was dismantled and rebuilt at its current location as one of the buildings of the Air army, who used to name buildings by letters: this new comer was assigned the letter Y, hence its name from then. During rebuilding, it was made a little bit higher so it could host dirigibles airships. As such, its structure is remarkable. It became home of one of the first airships ever built (modest and humble as we – French people - use to be, we simply named it “La France”). This was the first machine built by human achieving a loop flight: it took off and came back to land on the exact same place, in front of the hangar (1884). For its structure and for being so closely associated, by design, usage, time and location to that historic flight, we believe Hangar Y would deserve its inscription as a WHS. For sure this would be a long way and the building would need some restoration works. As far as we could understand from recent searches, the association is still actively looking for funding. There is little information available about the Hangar Y, not even on the website of the city of Meudon, no news about a potential nomination or the state of conservation or its accessibility. Obviously, it is not open to the public. But it was just a detour of twenty minutes on our route from Versailles to Fontainebleau, and so we decided to pay a short visit to this tentative site. The hangar is easy to find, it is located at a roundabout in the south of Meudon (Avenue de Trivaux / Cavalière de Latour). The photo shows the view from the street. From there, the building seems to be in a good state of conservation, but we could not get closer, the gate was closed. There is only an information panel explaining the history of the building. We went down the street to the backside of the hangar. 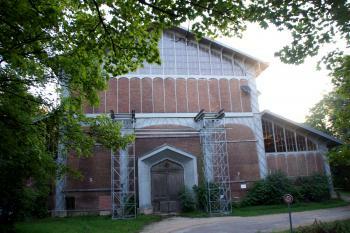 The building is hidden behind a high wall and tall trees, only the upper part is visible. The gate of the adjacent property was open and so we could take a look at the back side. Here, most of the windows are broken and the metal frames are bent, but there seems to be no serious damage. The French Wikipedia entry reports on renovations in 2009, but there are no signs of current works. Unfortunately, we could not go closer to take a look inside because of a fence and dense scrub. It is difficult to finally assess the quality of the architecture without visiting the interior, but from the outside it does not seem outstanding. The Hangar Y is considered the first airship hangar in the world and one of the few that have been preserved, but I doubt that this would be sufficient for an inscription.